The quinolone resistance (qnr) genes are widely distributed among bacteria. We recently developed and applied probabilistic models to identify tentative novel qnr genes in large public collections of DNA sequence data including fragmented metagenomes. By using inducible recombinant expressions systems the functionality of four identified qnr candidates were evaluated in Escherichia coli. Expression of several known qnr genes as well as two novel candidates provided fluoroquinolone resistance that increased with elevated inducer concentrations. The two novel, functionally verified qnr genes are termed Vfuqnr and assembled qnr 1. Co-expression of two qnr genes suggested non-synergistic action. The combination of a computational model and recombinant expression systems provides opportunities to explore and identify novel antibiotic resistance genes in both genomic and metagenomic datasets. Expression of qnr genes protects type II topoisomerases from quinolone inhibition, and facilitates the selection of mutants with higher level of resistance [1, 2]. 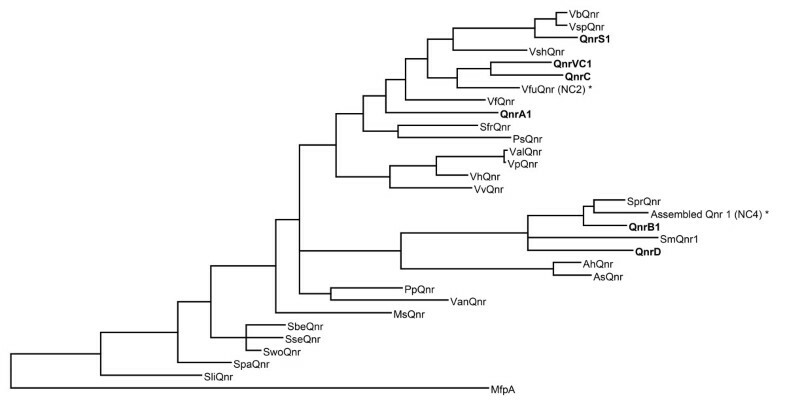 Six families of plasmid-borne qnr genes have been identified; qnrA, B, C, D, S and VC[1, 3–7]. In addition, chromosomal qnr alleles have been found in several bacterial species, alleles that may serve as progenitors of plasmid-borne qnr genes [8–10]. Identifications of the first representative of each qnr family relied on screening of clinical isolates and resistance transfer assays [1, 3–5, 7, 11], whereas subsequent studies have identified related qnr genes mainly by using PCR-based strategies [5, 9, 10, 12]. Lately, several qnr genes have been discovered based on sequence homology by use of alignment tools [11, 13]. However, this approach does not efficiently take into account the conserved pentapeptide repeat pattern of qnr genes, neither is it suitable for identifying qnr genes in short-read metagenomic datasets. The lack of optimized methods suggests that there very well could be many qnr genes waiting to be discovered. We have recently developed a computational method based on probabilistic Hidden Markov models with a potential to overcome these hurdles. By using this method a number of putative qnr genes were identified from a large collection of genomes and metagenomes . In this study we have experimentally evaluated four of these novel candidates (NC), nc1 – nc4 (Additional file 1), in recombinant Escherichia coli expression systems, an approach that has been used with success to characterize qnr genes previously [3–5, 7, 8, 13, 15]. The candidates and the first members of the six described families of mobile qnr genes were synthesized (Eurofins MWG Operon, Ebersberg, Germany) and subcloned into two expression vectors, pZE21 and pZA14 (Expressys, Ruelzheim, Germany), under the control of two different inducible promoters, PLtetO-1 and Plac/ara-1 respectively. The vectors carry either the ColE1 (pZE21) or the p15A (pZA14) origin of replication, and thus belong to different plasmid compatibility groups . Although several cloning procedures were tested, both by us and a contract lab, nc4 could not be subcloned into the pZA14 vector and was thus not evaluated under the control of the Plac/ara-1 promoter. However, this was not likely due to toxicity of the gene product, as has been reported for EfsQnr previously , since nc4 could be evaluated in the E. coli host using the pZE21 vector. The recombinant plasmids were electroporated into E. coli C600Z1 (Expressys), which expresses repressors for the two inducible promoters used . Conceivably, these kinds of expression systems allow the evaluation of gene candidates without knowledge of the intrinsic promoter, information that is often difficult to capture when genes are reconstructed from fragmented metagenomes. In addition, the approach does not depend on the functionality of an intrinsic promoter in a heterologous expression host. In order to investigate the genes’ capacity to confer fluoroquinolone resistance to the E. coli host, different concentrations of expression inducers were added to the Mueller-Hinton growth media used for fluoroquinolone susceptibility determinations with Etest® gradient strips (BioMérieux SA, Marcy l’Etoile, France). When the genes were evaluated under the control of the anhydrotetracycline (aTc)-inducible promoter PLtetO-1, all strains carrying known qnr genes showed ciprofloxacin minimal inhibitory concentrations (MICs) that increased with elevated inducer concentration (Figure 1A). In addition, strains carrying the novel qnr candidates nc2 and nc4 showed similar changes in ciprofloxacin susceptibility. All genes providing increased ciprofloxacin MICs after addition of aTc also conferred resistance when evaluated in the recombinant expression system controlled by the IPTG and arabinose-induced Plac/ara-1 promoter (Figure 1B). In the latter system a marginal MIC increase was observed also for nc1 and nc3 after addition of inducer, however a similar small increase was also observed for the control carrying the non-related luciferase gene instead of any qnr gene. Noteworthy, the choice of inducible promoter determined which qnr genes that gave rise to the strongest resistance phenotype, confirming the importance of genetic context. Comparable results were obtained when moxifloxacin susceptibility was evaluated after induced expression of the four candidates, nc2 and nc4 being the two that conferred fluoroquinolone resistance to the host (Additional file 2). Ciprofloxacin MICs for recombinant E. coli strains carrying known qnr genes or novel candidates ( nc1-4 ). The investigated genes are situated on pZE21 (A) or pZA14 (B), and expression was stimulated by adding indicated concentrations of the inducers aTc (A) or IPTG/Arabinose (B). Although recombinant expression in E. coli could not verify nc1 and nc3 as functional qnr genes, it does not rule out functionality in another host. The nc1 is relatively dissimilar to all known qnr genes (33% amino acid identity to QnrC and QnrS1) and originates from a coastal sea water metagenome, suggesting that the natural bacterial host might be distantly related to E. coli. The nc2 gene was identified in the sequenced genome of Vibrio furnissii and its deduced protein product shows 72% identity to QnrC and QnrVC1 (Figure 2). When the nc4 gene was identified in baby stool metagenomes, its gene product showed the highest similarity to QnrB determinants identified in Citrobacter freundii (up to 80% identity) . Later, sequences from Serratia marcescens encoding a protein, not verified to confer resistance, showing 98% identity with NC4 have been submitted to GenBank . Only three amino acids between position 142 and 146 differ between NC3 and NC4. Our results indicate that this region is of importance for the protein’s functionality, at least in E.coli. The two candidates show 78-79% identity to QnrB1 (Figure 2), for which two loop structures are important for the quinolone inhibiting action . In addition, mutational analyses of QnrB1 have identified several individual amino acids critical for its protective activity [21, 22]. However, amino acids 142–146 are not located within the loop structures and were not included or identified as critical in the mutational analyses. Phylogenetic tree showing the relationships between Qnr variants. The six plasmid-borne classes are shown in bold. The two candidates functionally verified in this work are marked with an asterisk (NC2 and NC4). The tree was constructed using MrBayes . Various bacteria, including E. coli, may carry two different qnr genes [24, 25]. The benefit of this is not known. We therefore constructed recombinant strains containing two qnr genes situated on different plasmids (pZE21 and pZA14). We evaluated six different combinations of qnr genes including qnrS together with either qnrA or qnrB, which are two of the combinations observed in clinical isolates [24, 25]. After induction with three different concentrations of inducers, at the most, a marginal increase in ciprofloxacin MIC (less than two-fold) was observed when both qnr genes were induced (Figure 3). This suggests a non-synergistic effect, which is in line with the assumed mode of action of Qnr proteins as well as with earlier susceptibility determinations showing that isolates carrying two qnr genes do not display a superior resistance phenotype [24, 25]. Ciprofloxacin susceptibility of recombinant E. coli strains carrying two different qnr genes. 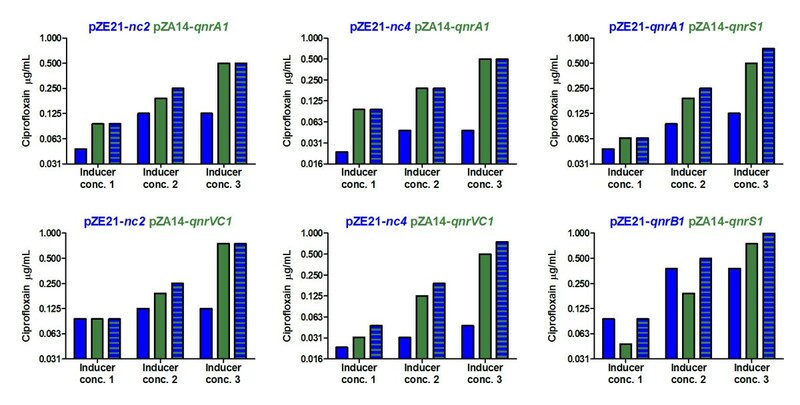 MICs of ciprofloxacin were determined after addition of inducers at three different concentrations described in Figure 1, which stimulated expression from the pZE21 plasmid (blue bars), the pZA14 plasmid (green bars), or both (striped bars). The header of each graph describes the qnr content of each strain and from which plasmids they are expressed. We suggest that the two identified and experimentally verified qnr genes nc2 and nc4, which provide resistance to the E.coli host at the same level as previously reported qnr genes, should be termed Vfuqnr and assembled qnr 1, respectively (Figure 2). The name Vfuqnr reflects the host of the gene, whereas the latter name is chosen to reflect that the gene is assembled from metagenomic DNA, and that the host is not known. The nucleotide sequences of Vfuqnr and assembled qnr 1 have been submitted to GenBank (accession number BK008765 and KF278752, respectively). To conclude, we have identified two novel, functional quinolone resistance genes. The development of a probabilistic Hidden Markov model and inducible recombinant expression systems together provided an efficient approach for exploring bacterial genomes and fragmented metagenomic datasets for the presence of novel qnr genes. We propose that a similar concept could be developed and used to identify resistance genes for other classes of antibiotics as well. This work was supported by the Swedish Research Council, Formas, MISTRA, the Adlerbert Research Foundation, and the Life Science Area of Advance at Chalmers University of Technology. CFF designed and performed the cloning and antibiotic susceptibility determination experiments as well as drafted the manuscript. FB performed the bioinformatic analyses and revised the manuscript. DGJL and EK conceived the study and revised the manuscript. All authors read and approved the final manuscript.